I found myself, lately, to consider more and more, the ways and practices for “good” decisions. The decision we made influence not only our actions but as well and those of the people we interact with and eventually influence (in a positive or negative way) their life. Potentially, “bad” decisions can influence negatively, not only our life but, that of others as well. Good decisions on the other part can multiply the positive effects for us and many more other individuals (even people we don’t know about!!!). But, mind you, that decision is not just a course of action. It is a first and foremost selection. A selection of A versus B or even C. A selection of a whole cluster of mutually influencing events you wish to come true in your life. And, the most of the time, not every bit of the wishful events come together. Sometimes, tend to come with lateral events that are not desired or wish for. Cause and effect. Nothing can be selected, isolated, by its surroundings, even if you have planned it thoroughly and meticulously. For this, you should lay down good foundations. One of the best foundation to base your decision, in my opinion, is a concept taught by Neuro-linguistic programming (NLP), stating that for each decision you should produce at least 3 different alternatives and course of actions. One alternative is one-way road and a compulsory one (i.e you don’t have any option), two alternative decisions. 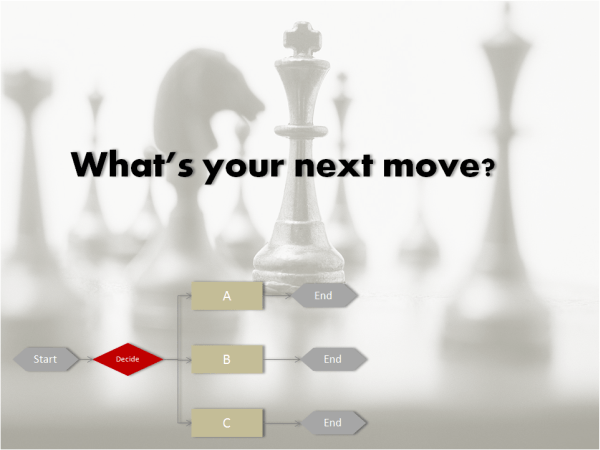 One alternative is one way road and a compulsory one (i.e you don’t have any option), two alternative decisions constitute a dilemma, but three and more alternatives can constitute a real decision process, aiming at required results and providing you all the freedom you need of selecting and implementing the best one (for you). Beyond that approach, there are a plethora of tools to lead you in good decisions and ones you can employ, for guiding you in the decision process. Some of that is difficult to cope with, some are too technical and some are cumbersome to incorporate it! What productivity means to you? How would you be more productive in life and business? How would become more cautious on the other’s needs? Do you want to join the club of over-achievers? It is easy if you know how! Read my free e-Book and you will find out what it takes to become more productive. Subscribe today and become the productive person you always dreamed of being! Some of that is difficult to cope with, some are too technical and some are cumbersome to incorporate it into your life. All, though, have their value. Two of the best tools you can use in order to enhance your decisions and your life are the Four Stages of Competence Model and the Covey’s Time Management Matrix. 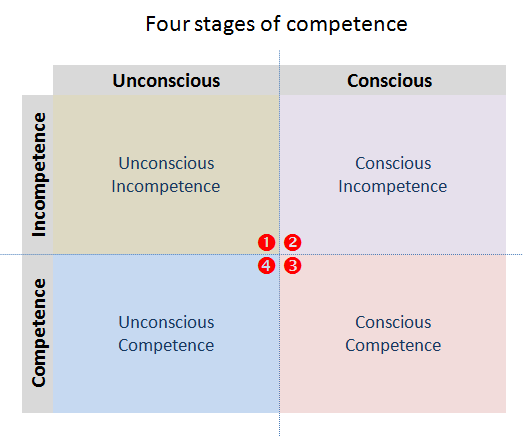 The Four Stages of Competence Model refers to the self-learning and skills development, covering “the process of progressing from incompetence to competence” [from Wikipedia: Four stages of competence]. As a descriptive tool is valuable in describing the process for the mastery of a new skill or knowledge and as a decision tool can support and direct our thoughts and actions towards the objective of unconscious competence, in which we can practice or implement our new knowledge and skills, effortlessly. Following this line of thought, as individuals, we should incorporate our new skills, attitudes, principles, goals, objectives in our lives in a manner that these can become characteristic attributes of our everyday workflow, and leave us more time and space for focusing on our goals. In this sense, the aforementioned model becomes a valuable asset in our way of thinking about self-development and leadership, while provides a structure. ” present a more efficient quadrant for deciding what the important things are for us and what we do with them. 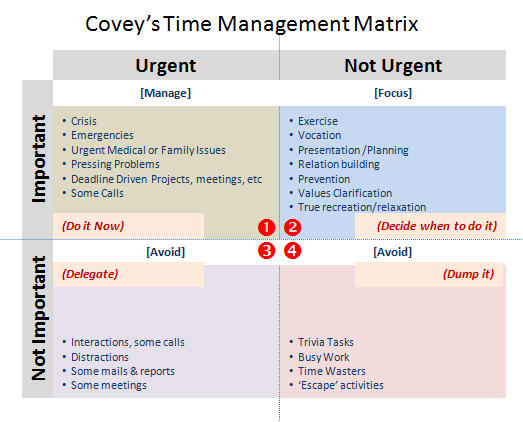 In the book, Covey describes a framework for prioritizing work that is aimed at long-term goals, at the expense of tasks that appear to be urgent, but are in fact less important. 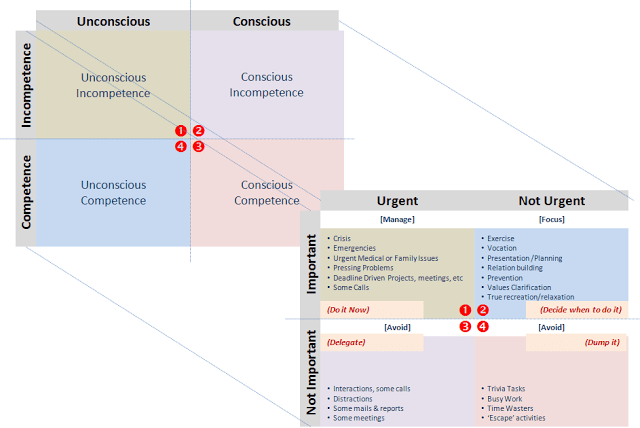 This is his 2×2 matrix: classifying tasks as urgent and non-urgent on one axis, and important or non-important on the other axis. His quadrant 2 has the items that are non-urgent but important. These are the ones he believes we are likely to neglect; but, should focus on to achieve effectiveness. The most of the times we employ “rules of the thumb” or “mechanical” (filtered by habits and adopted attitudes) practices, that not often furnished the intended results. This quadrant, though, not only attempts to provide a viable solution to this problem but provides a valuable tool, and a practical approach, that can be easily followed, practiced and incorporated into your everyday activities, providing content as well and context, on the how we aim at achieving our goals and what matters most, for us. Both quadrants can be essential tools and aids in a decision process and can provide a base of reference not only for the decision process itself but as well for the foundations of the decisions. If they can be tied together in the framework of an everyday practice can provide you a base for an essential upgrading decision-making process that would benefit, in more than one ways, your life. What do you think? These quadrants can be incorporated in your everyday life and provide more required results, or not? These tools, can help you making better decisions, or not?